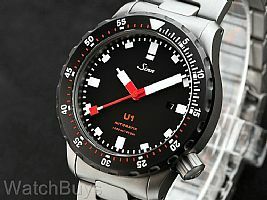 This is a special edition of the Sinn U1 SDR, and we've added the letter "T" for good reason - the watch is fully Tegimented. Sinn has just completed producing a limited production of this series for us and unlike the standard Sinn U1 SDR which features a Tegimented bezel, the Sinn U1-T SDR is fully Tegimented on the entire watch. The Sinn U1-T SDR features the same great case design made in-house from German submarine steel at Sinn's case making facility in Glashutte, Germany. Once the case is complete, the Tegimenting process begins, and when we say "fully Tegimented" we mean what we say - case, crown, black bezel, case back, the bracelet and even the anti-reflective coating. In summary, the Sinn U1-T SDR is one tough watch that is designed to both last and look great over time. We love the contrast of the black bezel with the fully Tegimented submarine steel case. 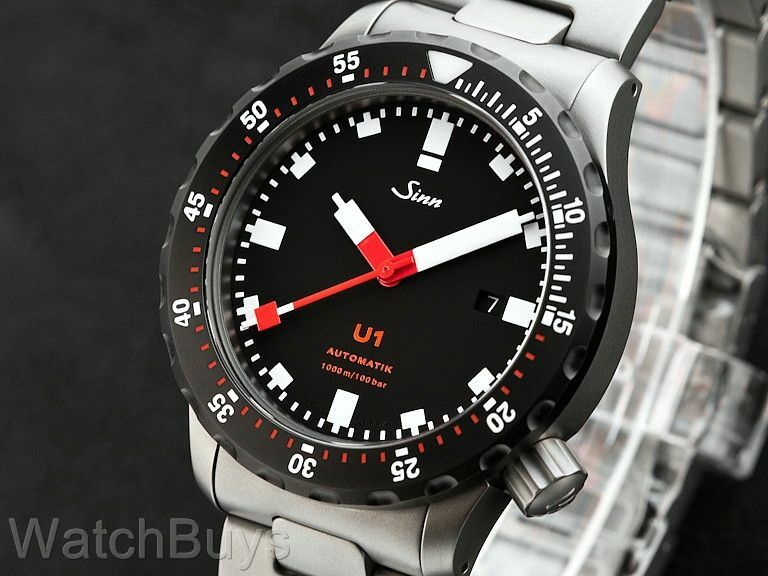 The Sinn U1-T SDR case is made from the same steel that is also used in the construction of the outer hull of submarines. The steel was procured by Sinn from a steel supplier to Emden GmbH, one of Germanys North Sea shipbuilding yards who construct submarines from the very same steel. The international testing lab of Germanischen Lloyd has tested the Sinn U1-T SDR, and determined that the watch can be certified as water resistant to 1,000 meters. This same firm tests submarines for their ability to withstand the effects of underwater use. "Superb Build Quality - A Tank with Class"
Verified Owner Comments: As a designer with an eye towards simple but classic dials - and a watch lover who appreciates technology - few watches hold a candle to this Sinn. The addition of the tegimented black bezel and bracelet makes this a solid tool watch with and elegant demeanor. Fits great on my large wrist and is never to heavy that it cannot be worn everyday. Love this piece. Especially at the price point. "Amazing watch for the money"
Verified Owner Comments: I have owned lots of so called "high-end" watches. This is built better than almost all of them and at a fraction of the price. This one has a lot of character. Bottom line: If you don't have one, get one!